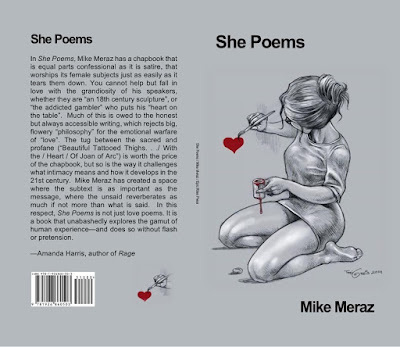 She Poems is American poet Mike Meraz’s latest collection. It consists of 30 minimalistic confessional poems. The poems are less than a page in length and they all hug the left margin of the page. Like Shakespeare’s love sonnets the poems do not have formal titles but rather are numbered 1 to 30. These are clear, highly accessible free verse poems which focus on the poet’s relationship with a variety of women and his accompanying thoughts and feelings on love. 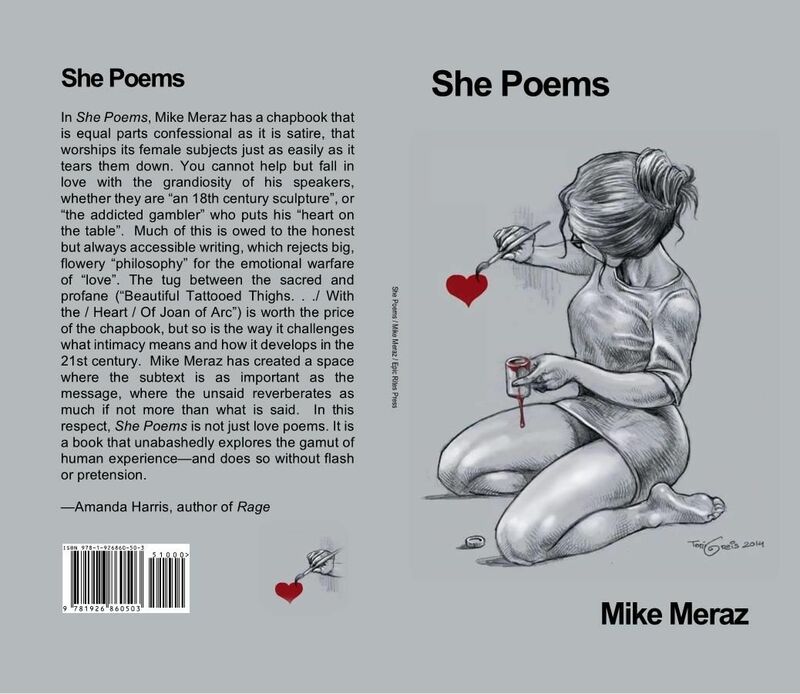 In She Poems, Meraz is usually writing about young love and not the banal domesticity of marriage. His descriptions of women express a tenderness in a good-humoured, affectionate way. His language is discreet and nuanced rather than erotically explicit. He treats his women with great respect and as equals, even when things fall apart. The front cover is illustrated by Toni Greis and is of a young girl with glasses painting a small red heart on her bedroom wall. Meraz saw Greis’s work on Facebook and after messaging him about She Poems Greis quickly became involved in the project. She Poems is a candid, diverse collection of poems about fledgling relationships. The poems are clearly crafted and arranged. As you read through the collection, the words might provoke you to recall your own special moments of youthful love and innocence. Q: You have been writing for many years. Do you have a regular routine in getting it down? I don’t have a regular routine. I basically write when an idea or poem come to me. I could be at work, or in the shower, or riding my bike. Sometimes I will be reading a book or listening to music and a memory or the first few lines of a poem will come to me and I will jot it down. But there is no routine, it is always spontaneous. Q: How do you describe your style in 'She Poems'. To what extent are they confessional? They are all confessional minimal poems. All the poems in the book are based on true events or at least inspired by true incidents or circumstances. I can’t write purely off imagination. My imagination works off reality. My style is very simple, I think, with complex ideas. Q: When did you first think you had a book in the making? (For example, had you written a few poems previously and thought this was a great concept for a book? I noticed I was writing a lot of poems about a particular girl at the time. I was going to call it “(the name of the girl) Poems” but then I started writing poems about other women in my life or had been in my life. The writing happened in a span of about 2 years. It was then I realized I had a book in the making. Also, I was writing a lot of poems with the word “she” in it. I would never mention names, just “she this...” “she that…” So that’s where the title comes from. The book basically named itself. I just went with it. Q: How did you get it up and reading thru Epic Rites Press? Wolf Carstens, the editor of Epic Rites Press, has been familiar with my work for some years now, probably since 2010. He has always told me if I ever have a book in the making to send it his way. When I was finally finished and comfortable with this work, I did just that. I think it took him a day or two to read it and respond with an affirmative yes. I was happy because Epic Rites is a solid press. You can just tell by the way he does things, he means business. I am glad to be on board. Q: You appear to represent many different women in your poems. How many are there? /Are they composites or individuals? Well, after reading this question, I actually counted and there are 19 women in the book. I was actually surprised by this number. If you would have asked me off the top of my head, I would have said 12 or 13. But there are 19. These are women from my late twenties to my mid thirties to the past few years. Some women in the book I didn’t even know personally. I just saw them on the street or at work. I am not sure what inspires a poem in me. But it is some affect in the heart and brain. But all the women in the book are individuals not composites. Q: How did the illustrator Toni Greis get involved in this project. Was he given a brief? I found Toni Greis through facebook. I was looking for a cover artist, and this was actually the hardest part of putting the book together. I petitioned other artists but nothing seemed to hit the mark.I wanted something that looked pro. I didn't want it to look like some small time book. I wanted it to stand up against anything you could find in a real bookstore. So I was on facebook one day and I saw some of Toni’s work and something in my mind said, ‘that’s it.” So I messaged him through facebook and after explaining to him the project, and showing him the actual illustration I wanted to use, he agreed. I was very happy when he said yes. Q: What qualities are you looking for/ not looking for in a woman? This is a broad question and very hard to answer. I am not looking for someone who is boring. I need someone who is exciting, fun, and dramatic. Now this does not always mean this is the easiest type of woman to be with, because passion and energy run both ways. But as a writer, this is the type of woman who holds my attention. Physically, I usually go for curvy women, but there have been exceptions. I just like passion and energy. I need someone to play off of, like a muse. Q: In your book you show many different aspects of love. What is your view of love? As I have gotten older my view of love has changed. I used to be very idealistic when it came to love. I had this standard that was very high. Now I am more relaxed about the whole idea of love, less judgmental, more easy-going. I guess, because I understand human beings more, we are all flawed; there is no girl with the golden eyes and the golden heart out there. There a great girls, but with everything there are downsides. It’s like you have a choice, be idealistic and lonely or relax a bit and have some fun, enjoy life, try to find the good things and attribute them to your life. I guess, that’s a lot of what the book is about. Even in the bad experiences there is humor. In heart break there is wisdom. We can go through life being conquered by it. Or we can be clever and turn the bad experiences into poems and art and have the last laugh at life. Q: Is your blog black-listed magazine still running? Black-Listed Mag is still up and running but I am not publishing as often as I used to. I will usually let the submissions pile up for a month or two then in one weekend post a bunch of stuff. But it is still there. I have thought about ditching it because it does take up time. But then I think it’s still a cool site for good underground poetry. I have another book in the works about the writer’s life. I am not sure when this will be out as I have yet to actually put it together. But there are about 40 poems in the vault that I think would make a good book. It’d be in the same style as She Poems, very minimal, confessional poems. I am hoping to have it out by 2017. For now, I am concentrating on She Poems. So far it has done better than expected, so I am excited about it.